Pour in egg whites, and mix on low until just incorporated. Mix in the buttermilk in two installments, on a low speed. Add in vanilla, espresso, and oil, and mix at a low speed until fully incorporated. Scrape down the sides of the bowl with a spatula, then beat on medium high for about 30 seconds. To accelerate the cooling process, I like to pop my cake layers in the freezer once I’ve removed them from the cake pans. While the cake layers bake and cool, prepare the frosting. Beat the butter on high for 30 seconds with a paddle attachment, until smooth. Slowly add in the powdered sugar, 1 cup at a time. Alternate with small splashes of cream. Once fully mixed, add in the vanilla and salt, and beat on medium low until the ingredients are fully incorporated, and the desired consistency is reached. If the frosting is too thick, add in cream (1 teaspoon at a time). If the frosting is too thin, add in more powdered sugar (quarter of a cup at a time). Soak 20 oz. of dark cherries in 1/2 cup of simple syrup for about 30 minutes. I used frozen cherries from Whole Foods for the filling, and fresh cherries for the garnish! Once the cake layers are fully cooled, assemble the cake. 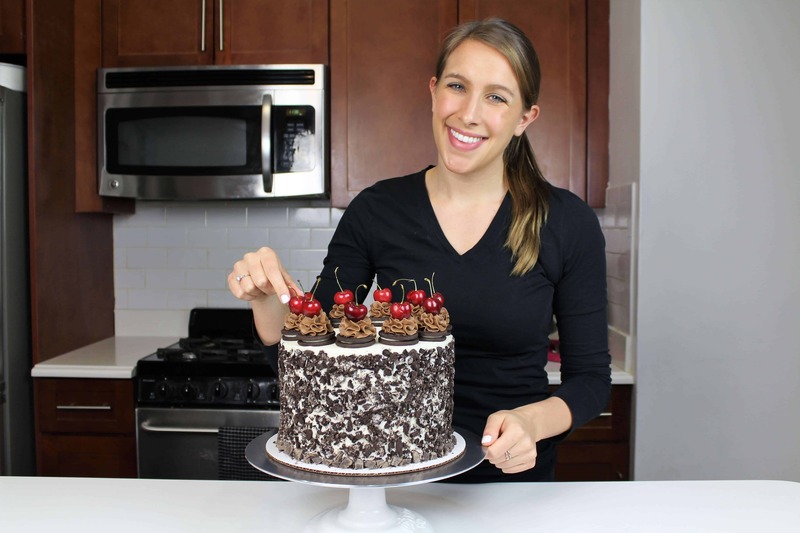 Stack and frost layers with buttercream, adding 1/3 of the cherry mixture on top of each layer of frosting. Sprinkle with 1/3 cup of crushed Oreos, and repeat with remaining cake layers. 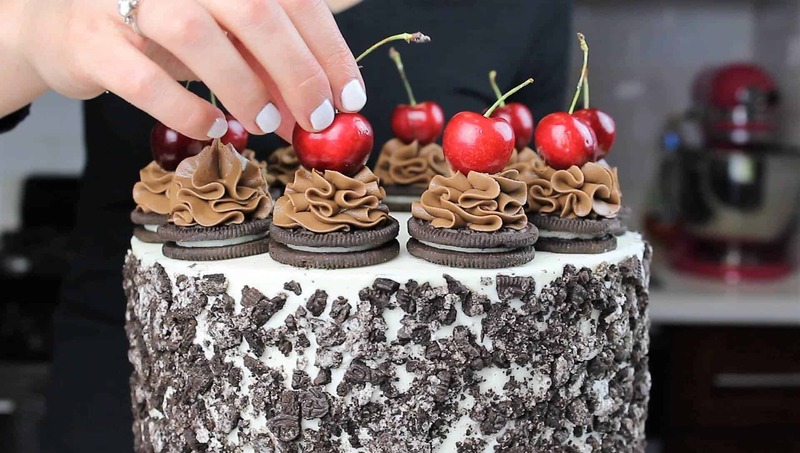 Apply a thin crumb coat, being sure to trap in all cherry juice and Oreo bits. Chill cake in freezer for 5 minutes. Once the crumb coat is firm to the touch, apply, a second, thicker coat of frosting. Smooth with a bench scrapper. If you want to see a full tutorial for how I get smooth sides on my cakes, you can click here. 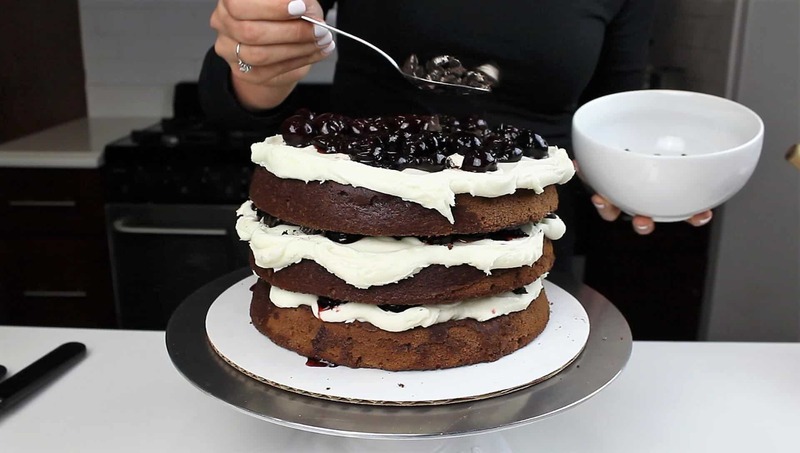 Gently press crushed Oreos onto the sides of the cake. Line top of cake with Oreos, and pipe a large swirl of buttercream on top of each Oreo. Top each swirl with a fresh cherry. The cake looks amazing and sounds delicious! 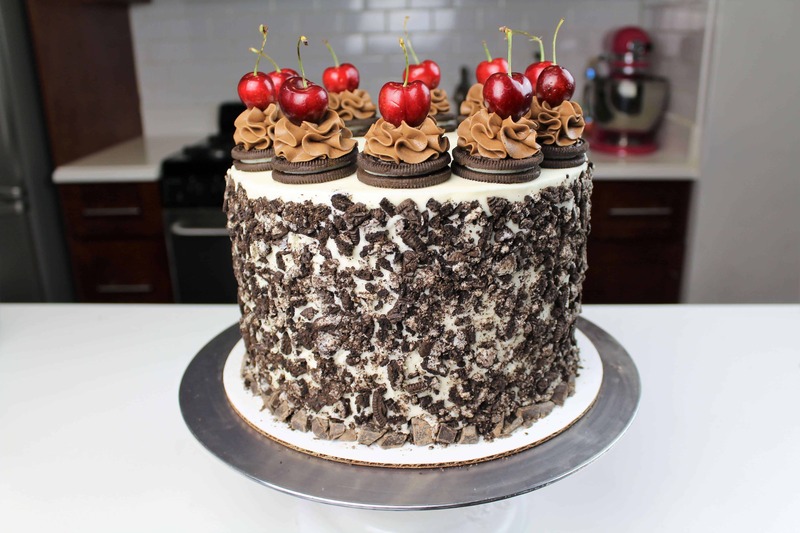 I love the chocolate with the cherries! ? Thanks! I so agree, it’s the perfect combination!! Would this be a good birthday cake? mmm, let me change that… Could you or could you not switch the american buttercream to something else? Like chocolate ganache? you could definitely use chocolate ganache in place of the buttercream! I don’t have any chocolate ice cream drip cakes, so sorry!